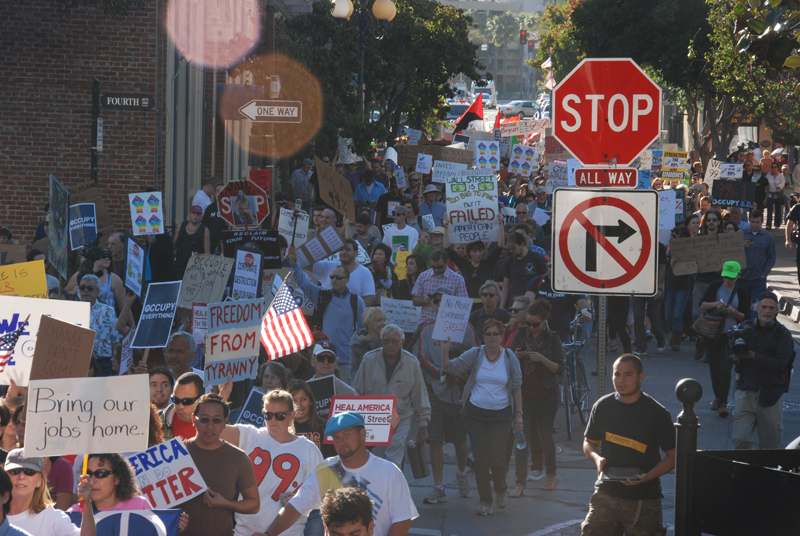 Occupy Wall Street protesters march through downtown San Diego – during one of the peaks of the movement in San Diego (10/7/11). In the new space that appears, however briefly, the old rules no longer apply. New rules may be written or a counterrevolution may be launched to take back the city or the society, but the moment that counts, the moment never to forget, is the one where civil society is its own rule, taking care of the needy, discussing what is necessary and desirable, improvising the terms of an ideal society for a day, a month, the 10-week duration of the Paris Commune of 1871, or the several weeks’ encampment and several-month aftermath of Occupy Oakland, proudly proclaimed on banners as the Oakland Commune. Those who doubt that these moments matter should note how terrified the authorities and elites are when they erupt. That fear is a sign of their recognition that real power doesn’t only lie with them. (Sometimes your enemies know what your friends can’t believe.) That’s why the New York Police Department maintained a massive presence at Occupy Wall Street’s encampment and spent millions of dollars on punishing the participants (and hundreds of thousands, maybe millions more, in police brutality payouts for all the clubbing and pepper-gassing of unarmed idealists, as well as $47,000 for the destruction of the OWS library, because in situations like these a library is a threat, too). Those who dismiss these moments because of their flaws need to look harder at what joy and hope shine out of them and what real changes have, historically, emerged because of them, even if not always directly or in the most obvious or recognizable ways. Change is rarely as simple as dominos. Sometimes, it’s as complex as chaos theory and as slow as evolution. Even things that seem to happen suddenly turn out to be flowers that emerge from plants with deep roots in the past or sometimes from long-dormant seeds. It’s important to ask not only what those moments produced in the long run but what they were in their heyday. If people find themselves living in a world in which some hopes are realized, some joys are incandescent, and some boundaries between individuals and groups are lowered, even for an hour or a day or — in the case of Occupy Wall Street — several months, that matters. The old left imagined that victory would, when it came, be total and permanent, which is practically the same as saying that victory was and is impossible and will never come. It is, in fact, more than possible. It is something that participants have tasted many times and that we carry with us in many ways, however flawed and fleeting. We regularly taste failure, too. Most of the time, the two come mixed and mingled. And every now and then, the possibilities explode. In these moments of rupture, people find themselves members of a “we” that did not until then exist, at least not as an entity with agency and identity and potency. New possibilities suddenly emerge, or that old dream of a just society reemerges and — at least for a little while — shines. Utopia is sometimes the goal. It’s often embedded in the insurrectionary moment itself, and it’s a hard moment to explain, since it usually involves hardscrabble ways of living, squabbles, and eventually disillusionment and factionalism, but also more ethereal things: the discovery of personal and collective power, the realization of dreams, the birth of bigger dreams, a sense of connection that is as emotional as it is political, and lives that change and do not revert to older ways even when the glory subsides. Sometimes the earth closes over this moment and it has no obvious consequences; sometimes it’s the Velvet Revolution and the fall of the Berlin Wall and all those glorious insurrections in the East Bloc in 1989, and empires crumble and ideologies drop away like shackles unlocked. Occupy was such a moment, and one so new that its effects and consequences are hard to measure. I have often heard that Freedom Summer in Mississippi registered some voters and built some alliances in 1964, but that its lasting (if almost impossible to measure) impact, was on the young participants themselves. They were galvanized into a feeling of power, of commitment, of mission that seems to have changed many of them and stayed with them as they went on to do a thousand different things that mattered, as they helped build the antiauthoritarian revolution that has been slowly unfolding, here and elsewhere, over the last half century or so. By such standards, when it comes to judging the effects of Occupy, it’s far too soon to tell — and as with so many moments and movements, we may never fully know. If aftermaths are hard to measure, preludes are often even more elusive. One of the special strengths of Thank You, Anarchy, Nathan Schneider’s new book about Occupy Wall Street, is its account of the many people who prepared the fire that burst into flame on September 17, 2011, in lower Manhattan, and that still gives light and heat to many of us. We know next to nothing about that drummer girl who walked into a Parisian market where many people were ready to ignite, to march, to see the world change. With every insurrection, revolution, or social rupture, we need to remember that we will never know the whole story of how it happened, and that what we can’t measure still matters. But Schneider’s book gives us some powerful glimpses into the early (and late) organizing, the foibles and characters, the conflicts and delights, and the power of that moment and movement. It conveys the sheer amount of labor involved in producing a miracle — and that miraculousness as well. This kind of tiny personal change can undoubtedly be multiplied by the hundreds of thousands, given the number of Occupy participants globally. But the movement had quantifiable consequences, too. Almost as soon as Occupy Wall Street appeared in the fall of 2011, it was clear that the national conversation had changed, that the brutality and obscenity of Wall Street was suddenly being openly discussed, that the suffering of ordinary people crushed by the burden of medical, housing, or college debt was coming out of the shadows, that the Occupy encampments had become places where people could testify about the destruction of their hopes and lives. California passed a homeowner’s bill of rights to curtail the viciousness of the banks, and in late 2012 Strike Debt emerged as an Occupy offshoot to address indebtedness in creative and subversive ways. Student debt suddenly became (and remains) a topic of national discussion, and proposals for student loan reform began to gain traction. Invisible suffering had been made visible. Change often happens by making the brutality of the status quo visible and so intolerable. The situation everybody has been living in is suddenly described in a new way by a previously silenced or impacted constituency, or with new eloquence, or because our ideas of what is humane and decent evolve, or a combination of all three. Thus did slavery become intolerable to ever more free people before the Civil War. Thus did the rights of many groups in this country — women, people of color, queer people, disabled people — grow exponentially. Thus did marriage stop being an exclusive privilege of heterosexuality, and earlier, a hierarchical relationship between a dominant husband and a submissive wife. Occupy Wall Street allowed those silenced by shame, invisibility, or lack of interest from the media to speak up. As a result, the realities behind our particular economic game came to be described more accurately; so much so that the media and politicians had to change their language a little to adjust to — admit to — a series of previously ignored ugly realities. This, in turn, had consequences, even if they weren’t always measurable or sometimes even immediately detectable. Though Occupy was never primarily about electoral politics, it was nonetheless a significant part of the conversation that got Elizabeth Warren elected senator and a few other politicians doing good things in the cesspit of the capital. As Occupy was, in part, sparked by the vision of the Arab Spring, so its mood of upheaval and outrage might have helped spark Idle No More, the dynamic Native peoples’ movement. Idle No More has already become a vital part of the environmental and climate movements and, in turn, has sparked a resurgence of Native American and Native Canadian activism. Occupy Wall Street also built alliances around racist persecution that lasted well after most of the encampments were disbanded. Occupiers were there for everything from the Million Hoodie Marches to protest the slaying of Trayvon Martin in Florida to stop-and-frisk in New York City to racist bank policies and foreclosures in San Francisco. There, a broad-based housing rights movement came out of Occupy that joined forces with the Alliance of Californians for Community Empowerment (ACCE) to address foreclosures, evictions, corrupt banking practices, and more. Last week a conservative warned that “Occupy may soon occupy New York’s City Hall,” decrying mayoral front-runner Bill de Blasio’s economic populism, alleged support for Occupy, and opposition to stop and frisk (while Schneider warns that the candidate is a liberal, not a radical). Several of the delayed consequences of Occupy’s benign influence may include recent general revulsion over the notion of the US bombing of Syria, Obama’s eleventh-hour openness to diplomacy over air strikes there, and Glass-Steagall-repealer Larry Summers’ just having removed his name from the small list of possible appointees to head the Federal Reserve. Or, more likely, it played no role whatsoever in any of those. Stocks up 20+% in 2013 …..so far.